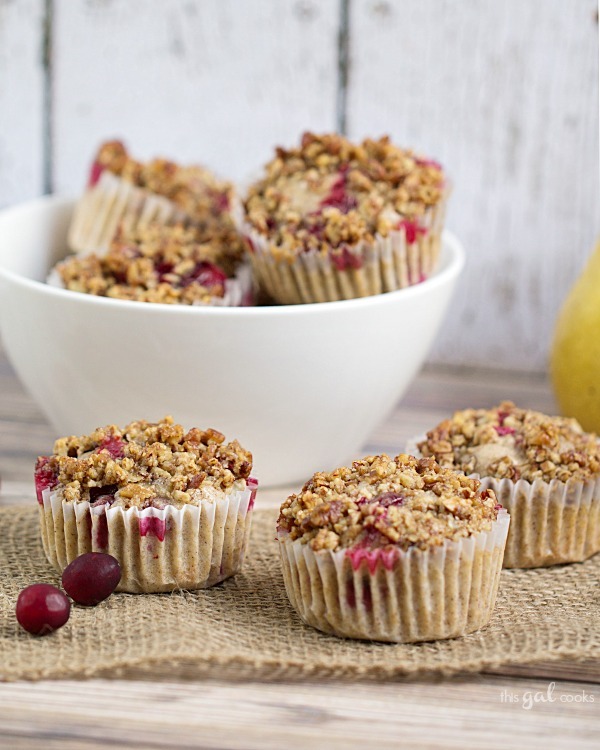 These Cranberry Muffins with Rum Pecan Streusel are perfect for a grab and go breakfast or to share with friends and family! Fresh cranberries and pears and baked into a delicious batter and topped with rum pecan streusel! It’s that time again. Spiked! Recipe Challenge time. This month’s booze of choice was spiced rum. 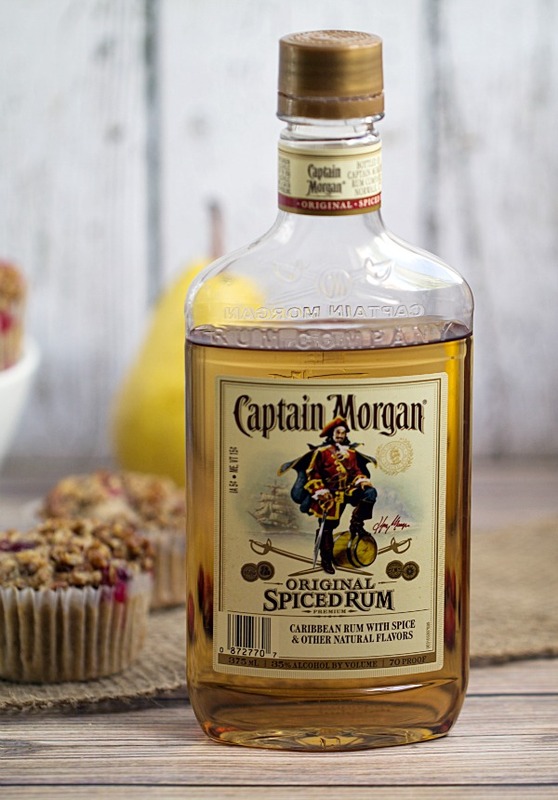 Now I am not a huge fan of drinking spiced rum but I sure do love baking with it. It does some amazing things to the taste and texture of food that your palate will thank you for. For example, the spiced rum made these cranberry muffins moist while boosting the spices baked into them. The smooth, slightly spiced flavors complimented the tart cranberries rather well. The rum pecan streusel brought these muffins to a whole different level than your typical streusel topping would have done. The meatiness and the crunch of the pecans were a perfect fit for a tart and sweet muffin. This muffin recipe came to me on a whim. I was actually going to make a cranberry pear tart for my Spiked! recipe but due to time constraints, I decided on the muffins. Seriously. I was making breakfast and then BOOM, this fantastic muffin recipe popped into my head. And on the second Monday of November, Julie created muffins. I also almost destroyed the muffins and part of my kitchen. I made breakfast. I made muffins. After making breakfast, I forgot to turn off the stove. After making muffins, I placed them on the cooling rack that I placed on the stove. I went upstairs for a few minutes and then I was like “why does something smell like it’s burning?” I went downstairs. The air was a little smokey. Ack! I left the stove on and the muffins are sitting on top of it! I lost four muffins from that batch. The bottoms of them were dark as night. I’m so happy that Ken and I did not decide to go out that morning. It would have been chaos when we returned. Have you ever done anything mindless like that? Line a 12 cup muffin pan with liners. Mix together the cranberries and rum. Set aside. In a mixing bowl, combine the lour, sugar, baking powder, salt, cinnamon and allspice. In another bowl, combine the egg, pear, canola oil. Stir in the cranberry/rum mixture. Pour into the flour mixture and mix until just combined. Spoon the mixture into 12 muffin cups. Make the streusel topping. Mix together the pecans and brown sugar. Stir in the 2tbsp spiced rum. Spoon over the muffins. Bake at 350 for 15-20 minutes. Do the toothpick test to make sure the muffins are done. They look so good! I love the spiced rum addition – I bet it’s awesome! And I’ve totally left the oven on before – not a good feeling. The spiced rum addition is awesome! Thank you so much for stopping by, Lindsay! 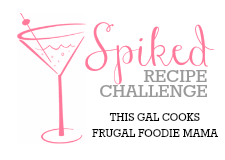 What a great recipe for the challenge! I never would have thought to add rum to muffins, but they look so moist and crumbly, just how I like them. Love the addition of both cranberries and pears in them! Thank you, Ashley! This recipe is definitely one I’ll be making again! Julie, I do mindless things like that all the time! I loose so many cooking utensils that way! Thanks heavens you ONLY lost 4 of these beautiful muffins (and that your house and kitchen are fine of course!)! Haha, sometimes I find myself mindlessly putting things into the fridge that don’t belong there! Or putting stuff that goes into the fridge into the pantry. I think we can attribute these behaviors to doing too many things at one time! Thank you for stopping by, Tanya! I love the sound of rum in here! What a fantastic idea, sneaking in a bit of rum in my breakfast! ;) Luckily you didn’t lose the entire batch. These are a looker. Have a great weekend Julie! Oh no! That’s scary, Anne! I tell everyone, see, this is why I sometimes turn around and go home while I’m on the way to work (I only work 4 miles from home.) Because I am paranoid that I leave the iron or the stove on! Thank you so much for stopping by, Anne! I still have cranberries, pecans and rum. I think I will be making these muffins again soon! Gorgeous Julie. The topping, I need some. Yikes, I’m glad you guys were home to catch it on time. I’m such a scatterbrain and have left the stove on a few times while cooking my oatmeal. It’s never a pretty mess to come back to and apparently I don’t learn and keep doing that hehe. These muffins look incredible and would totally cheer anyone up after cleaning up a mess! I love the sound of the spiked pecan streusel! The cranberries and pears sound awesome together and I can imagine how good these would taste! 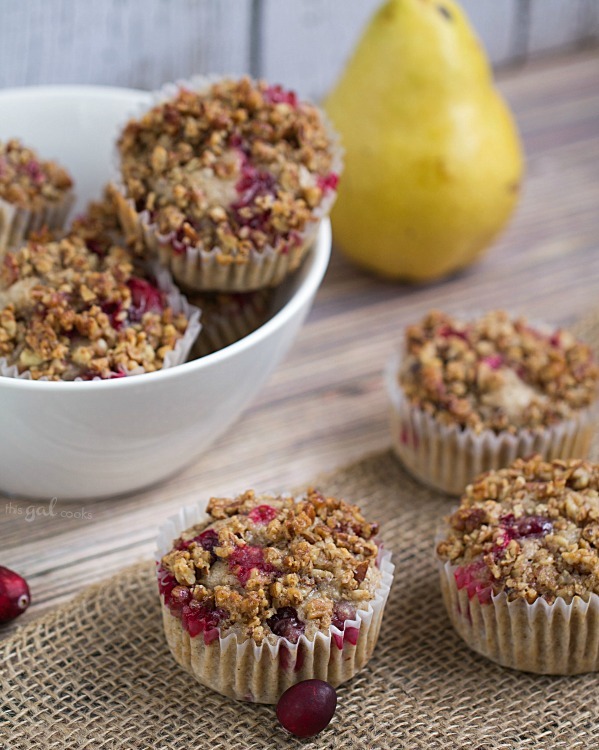 I love the combination of cranberries and pears, all the yummy spices, and the crunchy streusel topping! These look like a must-try!! Thanks so much for sharing at Saturday Night Fever, Julie!